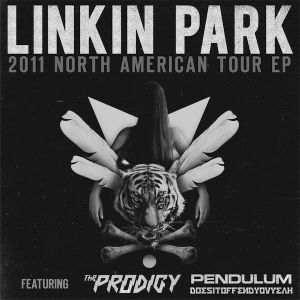 2011 North American Tour EP is a digital EP released in 2010 as a sampler to promote the eponymous Linkin Park tour. "We are excited to have three great bands come out with us on the upcoming North American Tour—The Prodigy, Pendulum and Does it Offend You, Yeah?. To help you get to know them, we put together a free digital EP containing a high quality MP3 from each band, as well as two live LP tracks from our recent show in Tel Aviv. We hope that you'll become as big a fan of these bands as we are. Get to the show early and check 'em out. P.S. If you like those live LP tracks, you can download any show you want at downloads.linkinpark.com. Also, if you're coming to a show on this tour, your ticket will come with an MP3 download of the entire performance." The first two tracks on the EP are exclusive Linkin Park recordings live at Tel Aviv, Israel on November 15, 2010. This was the band's first show in the country. "Omen" by The Prodigy was taken from their 2009 album Invaders Must Die, "Watercolour" by Pendulum was taken from their 2010 album Immersion and "We Are The Dead" by Does It Offend You, Yeah? was taken from their 2011 album Don't Say We Didn't Warn You. The 2011 North American Tour EP was available for free download on linkinpark.com as a tour sampler. It was a zip-file containing 5 MP3 320kbps tracks and 7 watermarked Linkin Park photos. This page was last edited on 25 March 2019, at 05:42.